Artificial intelligence may soon replace most people in the production process, but your position is safe. Manufacturing engineers will always play an essential role in factories, designing and operating computer networks, robots, machine tools, and materials-handling equipment. What is more, this career pays well (even entry level engineers earn above $60,000 in average), and you won’t need to outclass dozens of other people in the interviews. In fact, typically just a few people apply for each manufacturing engineer job opening. What will happen in the interviews? What matters the most for the hiring manages? And how can you improve your chances of making it through? We will try to find the answers in this article. Describe a time when you struggled to communicate something to your boss, colleague, or to a customer/vendor. How did you manage to get your message over? What motivates you the most in this job? What will motivate you to stay with us? Like in most other engineering interviews, the hiring managers will be interested to learn more about the work you have already done. This is true for both experienced professionals and fresh graduates. When fresh off the college, they may discuss your thesis, or projects you’ve worked on during your studies. When more experienced, the focus will be on real designs you’ve implemented and operated in your last job(s). Remember that most hiring managers don’t excel in engineering, or other technical skills. It is simply not their field of expertise. Therefor you should speak about your work in a simple way. Show them what you have done, and how it helped your former employers. Avoid technical terms, and speak with enthusiasm. In most of the cases this will be enough to convince them of your readiness for a technical aspect of the job. Once you walked through your resume, the interviewers will progress to ask some questions. Remember that in nine out of ten cases, they won’t ask you any technical questions. You have a degree in engineering, and (walking through your resume) they already know that you can handle the technical aspect of the job. What is more, these people are HR professionals, not technicians. They have no clue about right answers to technical questions… So they will do their best to avoid asking them. Bering this in mind, you will deal mostly with personal (screening) and behavioral questions. Let’s have a look at some of them. Try to address both the position and the company in your answer. You can say that your education, skills, and professional interests make from you an ideal candidate for the job of manufacturing engineer. If you have any relevant experience, you can refer to it in your answer. But more than anything else, you should stress that you enjoy doing what engineers do in their work. Secondly, refer to their company. Perhaps you find their production interesting, or the job challenging. Or you like their final products, vision and goals of the company, or something else. One way or another, you should clearly show them that you did not apply by accident, and know why you want to work for them. Proactive approach is a keyword to remember. Tell them that you plan to do daily inspections, to always look for areas of manufacturing process you can improve. Show them that you do not plan to sit in your nice office all day long, drinking coffee. But you plan to consult other employees, to walk in the production halls and look for things you can improve. Of course, the majority of time will be spent in front of the computer screen, where you will work on new designs and improvements to existing designs. But it is not the only thing engineers should do. Read the job description carefully, together with the website of your future employer. Reading them should help you to understand what will be expected from you in the job. 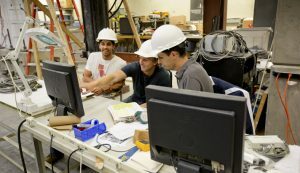 Though often overlooked by employers, communication skills are crucial for a good manufacturing engineer. You will often take feedback, and give instructions, to people who lack technical knowledge. Show the hiring managers that you are ready to step out of your comfort zone and change your language to get your message over. What is more, you can talk about various tools that help you with the task, such as illustrated charts, presentations, pictures, or a simple demonstration you’ll do for other employees to show them what they should do. Skilled manufacturing engineers are in high demand. Employers know that once you gain some experience with them, new doors will open for you, and you will get other job offers. They want to see whether they can count on you in a long run, whether it makes sense to invest in you. The truth is that we never know what tomorrow will bring. You can not promise any employer that you will stay with them for five or for ten years. 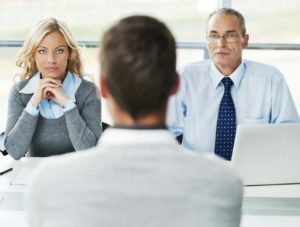 Once in an interview, however, you should try your best to convince them of your loyalty, and that you do not consider their company just a quick stop on the ladder of your professional career. Refer to your desire to learn and grow together with the company. Tell them that you see opportunities for career growth with them, and that you believe the job itself is motivating enough to keep you going. You can also talk about positions you may get with them later on, such as Advanced Manufacturing Engineer, or Engineering Manager. Why do you want to work for us, and not one of our competitors? Do you plan to progress in your studies distantly, while employed with us? Interview for a job of a manufacturing engineer does not belong to difficult interviews. A core of the hiring process consists in talking about your resume and work you’ve already done, and in personal and behavioral questions. Practice with the questions from this article, and do your homework, researching about your future employer, and the things they do. And if you are unsure how to answer the questions, or what to do in your interview, refer to our Interview Success Package. Brilliant answers to thirty most common interview questions (including the difficult behavioral questions) will help you greatly on your way to a coveted job contract.